The number of California drivers illegally using their cell phones while behind the wheel increased in 2018, a state observational study has found. Notably, use is highest among people driving alone. People stationed at intersections around the state observed that at any one moment, 4.5 percent of drivers were using their cell phones. That was an increase from 3.6 percent the previous year, and caused some concern among state highway safety officials. California drivers pay some of the highest gas prices in the country much of that is a federal, state and local tax, but 20 cents per gallon remains a mystery and drivers are starting to ask where that money is going. A professor at UC Berkeley discovered that amount adds up to more than $18 billion and legislators are now asking the attorney general to disclose where that money is being used for. "It amounts to three to five billion dollars a year that Californians are paying for gasoline above what we would normally expect to pay," said Severin Borenstein from the UC Berkeley Haas School of Business. The Department of Homeland Security has granted a four-month extension for California's REAL ID compliance program. The DMV now has until April to comply with REAL ID or to ask for another extension. In two weeks, millions of Californians who do not have a passport or other federally accepted ID may be barred from flying the friendly skies. Tomorrow -- Thursday, Jan. 10 -- marks the deadline by which the DMV needs to be granted an extension for its Real ID program. If the current extension is not renewed by the Department of Homeland Security by tomorrow, all California's driver licenses and ID cards will be invalid for domestic air travel starting Jan. 22. This figure includes the 2.4 million Californians who already have a real ID. You're not alone in shaking your fist and honking — maybe a tad too liberally — at misbehaving drivers on California roads. 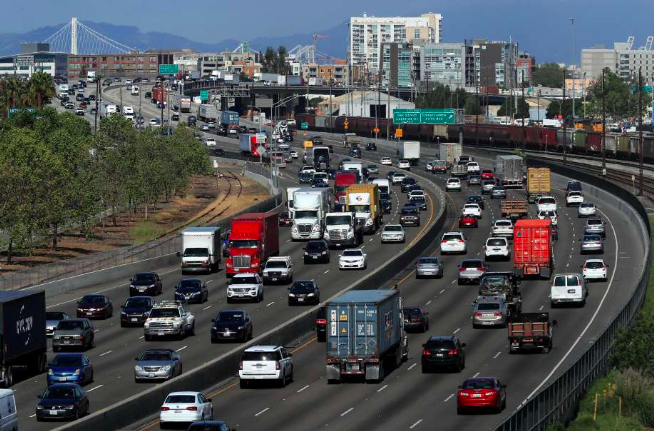 The Golden State is home to the most aggressive drivers in the nation, a recent study found. YourMechanic, a Mountain View car service startup, analyzed nine data points —including driver skill, car theft rates, weather conditions and road congestion — for every state in the U.S. It then ranked the states numerically in a handful of categories. California took the first spot only in the aggressive drivers category, with an "aggressive driving event" — i.e. speeding, brake checking, tailgating — occurring every 6.6 minutes, according to the report. Connecticut follows behind California with a rate of 8.2 minutes. California drivers are notoriously bad at driving in the rain. The typically sunny skies and mild weather of California can be a problem when it comes to operating a vehicle: When the rain comes, panic ensues. The data seems to prove the truth of this stereotype. Noah Deneau, an electrical and computer engineer, compiled weather data from the National Oceanic and Atmospheric Administration (NOAA) to show just how impactful rain is on Los Angeles traffic accidents. The infographic shows that at any time of the day, rainy weather causes more accidents than dry weather. At certain times of the day, the mean hourly accident rate nearly doubled. California joined about a half-dozen states this month in banning the use of a person’s gender when assessing risk factors for car insurance, a change that could potentially alter rates for scores of drivers across the state. The state, which is the country’s most populous, requires insurers to prioritize criteria like drivers’ safety records and years of experience behind the wheel when setting auto rates, but it also allows them to weigh other factors, like marital status. Gender had been among the optional criteria until the beginning of this year, when a new regulation went into effect prohibiting the practice.